Chlorine ranks among the top 10 chemicals produced in the United States. In 1992, about 10.5 billion kilograms (23 billion pounds) of the element were produced in the United States. Chlorine, in one form or another, is added to most swimming pools, spas, and public water supplies because it kills bacteria that cause disease. Many people also use chlorine to bleach their clothes. Large paper and pulp mills use chlorine to bleach their products. Chlorine is a greenish-yellow poisonous gas. It was discovered in 1774 by Swedish chemist Carl Wilhelm Scheele (1742-86). Scheele knew that chlorine was a new element, but thought it contained oxygen as well. Chlorine is a member of the halogen family. Halogens are the elements that make up Group 17 (VIIA) of the periodic table, a chart that shows how elements are related to one another. They include fluorine, bromine, iodine, and astatine. Chlorine is highly reactive, ranking only below fluorine in its chemical activity. 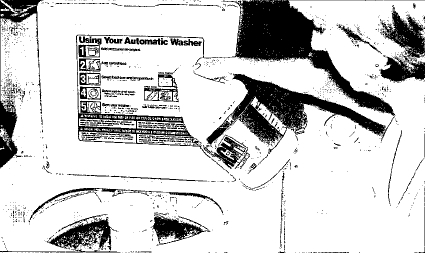 Bleach is a common household item used to help clean clothes. Chlorine compounds have been important to humans for thousands of years. Ordinary table salt, for example, is sodium chloride (NaCl). Still, chlorine was not recognized as an element until 1774, when Scheele was studying the mineral pyrolusite. Pyrolusite consists primarily of manganese dioxide (MnO 2 ). Scheele mixed pyrolusite with hydrochloric acid (HCl), then called spiritus salis. He found that a greenish-yellow gas with a suffocating odor "most oppressive to the lungs" was released. The gas was chlorine. Scheele found that the new gas reacted with metals, dissolved slightly in water, and bleached flowers and leaves. He gave the gas the rather complex name of dephlogisticated marine acid. Chlorine occurs commonly both in the Earth's crust and in seawater. 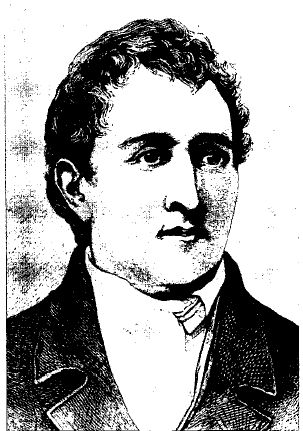 Swedish pharmacist Carl Wilhelm Scheele. Chlorine is a dense gas with a density of 3.21 grams per liter. By comparison, the density of air is 1.29 grams per liter. Chlorine changes from a gas into a liquid at a temperature of -34.05°C (-29.29°F) and from a liquid to a solid at -101.00°C (-149.80°F). The gas is soluble (dissolvable) in water. It also reacts chemically with water as it dissolves to form hydrochloric acid (HCl) and hypochlorous acid (HOCl). Chlorine does not burn but, like oxygen, it helps other substances bum. Chlorine is a strong oxidizing agent (a chemical substance that gives up or takes on electrons from another substance). Chlorine occurs commonly both in the Earth's crust and in seawater. Its abundance in the earth is about 100 to 300 parts per million. It ranks 20th among the elements in abundance in the earth. Its abundance in seawater is about 2 percent. The most common compound of chlorine in seawater is sodium chloride. Smaller amounts of potassium chloride also occur in seawater. The most common minerals of chlorine are halite, or rock salt (NaCl), sylvite (KCl), and camallite (KCl MgCl 2 ). Large amounts of these minerals are mined from underground salt beds that were formed when ancient oceans dried up. Over millions of years, the salts that remained behind were buried underground. They were also compacted (packed together) to form huge salt "domes." A salt dome is a large mass of salt found underground. Chlorine combines with all elements except the noble gases. Here, it reacts with sodium. 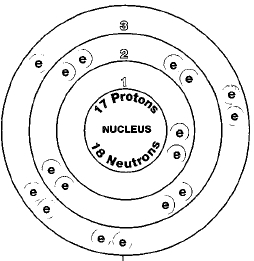 number of neutrons in the atom of any one element can vary. Each variation is an isotope. Seven radioactive isotopes of chlorine are known also. A radioactive isotope is one that breaks apart and gives off some form of radiation. Radioactive isotopes are produced when very small particles are fired at atoms. These particles stick in the atoms and make them radioactive. One radioactive isotope of chlorine is used in research. That isotope is chlorine-36. This isotope is used because compounds of chlorine occur so commonly in everyday life. The behavior of these compounds can be studied if chlorine-36 is used as a tracer. 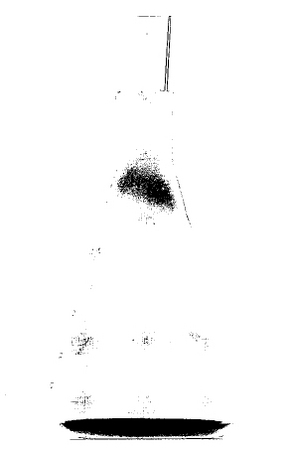 A tracer is an isotope whose presence in a material can be traced (followed) easily. For example, engineers are interested in knowing how seawater damages metals. This information is important in determining the best techniques to use in building ships. An experiment can be done by adding pieces of metal to seawater that contains radioactive chlorine-36. The sodium chloride in the seawater is changed slightly so that it contains radioactive chlorine instead of normal chlorine. As the sodium chloride attacks the metal, its actions can be followed easily. The radioactive chlorine, chlorine-36, gives off radiation. That radiation can be detected by holding an instrument near the experiment. A scientist can find out exactly what happens when the sodium chloride attacks the metal. Hydrogen gas (H 2 ) is also formed in the reaction. Chlorine is widely used throughout the world to purify water. In the United States, only about 6 percent of the chlorine manufactured is used in water purification. About three times as much is used in the paper and pulp industry as a bleach. Large amounts of chlorine minerals are mined from underground salt beds that were formed when ancient oceans dried up. About one-third of the chlorine produced in the United States goes to making ethylene dichloride. About 90 percent of ethylene dichloride goes to the manufacture of polyvinyl chloride (PVC). PVC is used to make piping, tubing, flooring, siding, film, coatings, and many other products. Ethylene dichloride has become one of the most popular products in American industry. About 4.5 billion kilograms (10 billion pounds) of the material are made each year. O ne of the most troubling uses of chlorine has been in making pesticides. A pesticide is a chemical used to kill pests. Pesticides have special names depending on the kind of pests they are designed to kill. Insecticides kill insects, rodenticides kill rodents (rats and mice), fungicides kill fungi, and nematicides kill worms. Certain chlorine compounds have become very popular as pesticides. These compounds are called chlorinated hydrocarbons. They contain carbon, hydrogen, and chlorine. Probably the most famous chlorinated hydrocarbon is dichlorodiphenyltrichloroethane, or DDT. DDT was first prepared in 1873, but was not used as a pesticide until World War II (1939-45). Public health officials were at first delighted to learn that DDT kills disease-carrying insects very efficiently. There was great hope that DDT could be used to wipe out certain diseases in some parts of the world. Farmers were also excited about DDT. They found it could kill many of the pests that attacked crops. By the end of the 1950s, many farmers were spraying huge amounts of DDT on their land to get rid of pests. But problems began to appear. Many fish and birds in sprayed areas began to die or become deformed. Soon, these problems were traced to the use of DDT. The fish and birds ate insects that had been sprayed with DDT or drank water that contained DDT. It had a toxic effect on the fish and birds, just as it did on insects. Bird populations declined drastically as DDT caused eggs to be so thin-shelled that young birds did not survive. Eventually, many governments began to ban the use of DDT. Since 1973, the United States has not allowed the compound to be used. It is still used in other nations of the world, however. These nations feel that the benefits of using DDT outweigh the harm it may cause. They feel that DDT can save lives by killing disease-causing pests. They know they can increase their food supplies by using DDT on crops. DDT is not the only chlorinated hydrocarbon used as a pesticide. Other compounds in this class include dieldrin, aldrin, heptachlor, and chlordan. The use of these compounds has also been banned or restricted in the United States. The U.S. government has decided the harm they cause to the environment is more important than the benefits they provide to farmers and other users. Another compound made using chlorine is propylene oxide (CH 3 CH0CH 2 ). There is no chlorine in propylene oxide, but chlorine is used in the process by which the compound is made. Propylene oxide is used to make a group of plastics known as polyesters. Polyesters are found in a wide range of materials, including car and boat bodies, bowling balls, fabrics for clothing, and rugs. At one time, a large amount of chlorine was used to make a group of compounds known as chlorofluorocarbons (CFCs). CFCs are a family of chemical compounds containing carbon, fluorine, and chlorine. CFCs were once used in a wide variety of applications, such as air conditioning and refrigeration, aerosol spray products, and cleaning materials. They are now known to have serious environmental effects and have been banned from use in the United States and many other countries in the world. The reason for this ban is the damage caused by CFCs on the Earth's ozone layer. Ozone (O 3 ) is a form of oxygen that filters out harmful radiation from the sun. When CFCs escape into the atmosphere, they attack and destroy ozone molecules. They reduce the protection against radiation provided by ozone. Chlorine gas is extremely toxic. In small doses, it irritates the nose and throat. A person exposed to chlorine may experience sneezing, running nose, and red eyes. In larger doses, chlorine can be fatal. In fact, chlorine gas was used during World War I (1914-18) by German armies as a weapon. Thousands of soldiers were killed or seriously wounded by breathing it. Those who survived gas attacks often were crippled for life. They were unable to breathe normally as a result of the damage to their throats and lungs. On the other hand, chlorine compounds are essential to plants. They become sick or die without it. In plants, chlorine is regarded as a micronutrient, which is a substance needed in very small amounts to maintain good health. Leaves turn yellow and die when plants get too little chlorine from the soil. Chlorine is produced by passing an electric current through a water solution of sodium chloride or through molten (melted) sodium chloride. Compounds of chlorine are important in maintaining good health in humans and animals. The average human body contains about 95 grams (about 3.5 ounces) of chlorine. Hydrochloric acid (HCl) in the stomach, for example, helps in the digestion of foods. Sodium chloride (NaCl) and potassium chloride (KCl) play an important role in the way nerve messages are sent throughout the body. Because humans eat so much salt, a lack of chlorine compounds is seldom a health problem. Chlorine gas is extremely toxic. In large doses, it can be fatal. On the other hand, chlorine compounds are essential to plants. is chlorine stile excite in sea water, after treatment by revers osmosis? Hey so I need to know everything bad, especially effects, that chlorine has. Hey... I had a question, is chlorine a gas when it hits water? Or does it turn into a powder? Can Chlorine become frozen? Or does it become a powder? that is due on Thursday of this week. Okay so im doing a project and im stuck on one question, How and when did chlorine find its way to earth?? yeah...good question. how did chlorine find its way to earth? Because my project is first thing tomorrow. if i put chlorine in a salted water that will help to reduce or eliminate the salt in water or is not going to change anything? also how can i turn salted water into a pure water chemically? Why do they use chlorine to clean the pools when they could do something else. There is a typo in the section Chemical properties. It says (chlorine helps other substances bum) It should say burn. Just letting you know bye! They use chlorine to clean pool because it kills illnesses and if you got sick from swimming in a puplic pool they could get sued. i have a question what is the temperature of chlorine and is it corrosive? If chlorine is in some chickens, why can we still eat chicken!?!? Well, if u r allergic to chlorine and get sick after going swimming in a pool, they cant get sued. It would be the swimmers fault for swimming knowing that there is chlorine in the pool. Can chlorine harm the human body ? if so how? I'm not so sure because if it is does it harm you when you go swimming? or if you drink it? What type of stone is it? And what is the name of the stone? I'm doing a project on Chlorine. What does Chlorine "NOT" react with? I am doing a project on Chlorine. Which elements make Chlorine "STRONGER"? What happens to chlorine after its reaction. What causes chlorine reactions?